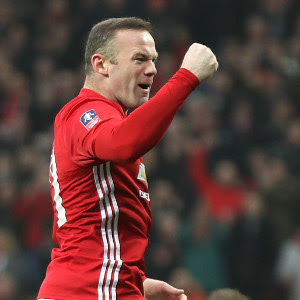 Manchester United striker Wayne Rooney equalled Bobby Charlton's club record of 249 goals as the FA Cup holders reached the fourth round with an emphatic 4-0 home win over Championship side Reading on Saturday. As Charlton watched on from the stands, Rooney gave United a seventh-minute lead with an opportunist strike and missed chances to set a new record after Anthony Martial had added the second. Marcus Rashford, who wasted several opportunities after being given a rare start up front, sealed United's eighth successive victory with two quickfire goals in the closing stages. United, who left top scorer Zlatan Ibrahimovic and France midfielder Paul Pogba on the bench, dominated throughout with some crisp passing at Old Trafford. Rashford and Rooney went close early on before the latter found the net with his knee after a dazzling solo run by Martial and a fine lofted pass from Juan Mata. Martial doubled United's lead in the 15th minute with a composed finish after a delightful one-two with Rooney, who missed two gilt-edged chances in the second half with the crowd roaring him on to reach the 250-goal milestone. Rooney shot wide from close range and goalkeeper Ali Al Habsi blocked his shot from two metres when a record-breaking goal seemed imminent. Rashford made it 3-0 with a composed finish after a defence-splitting by Michael Carrick in the 75th minute and he soon took advantage of Al Habsi's howler to blast the ball home from point-blank range. Share on Facebook, Twitter, and other social networks.